No more sticky fingers. 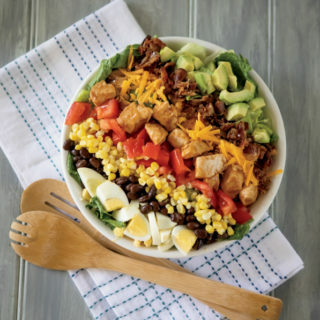 Serve your BBQ chicken Cobb salad-style by topping chopped lettuce with beautiful layered rows of cheese, beans, corn and tomatoes. Nutrition Highlights: Per Serving (1 main course salad with 2 tablespoons dressing): 417 calories, 18 g fat, 596 mg sodium, 29 g protein, 9 g fiber, 189 mg cholesterol, 37 carbohydrates, 10g sugar. To make the dressing, place the basil pesto, mayonnaise, garlic, buttermilk, lemon juice, and salt and pepper in a blender and blend until well combined. Set aside or store in the refrigerator. To make the salad, toss the chicken with barbecue sauce until thoroughly coated. Pile the chopped lettuce into a large, shallow serving bowl. Arrange the chicken in a horizontal row in the center of lettuce. Add all of the remaining ingredients except the dressing in horizontal rows on either side of the chicken. Serve immediately. The dressing can be made in advance and stored in the refrigerator for up to a week. For added crunch, add a layer of tortilla chips or leftover crumbled bacon.